The Hon. 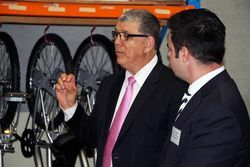 John Ajaka, the Minister for Disability Services and Ageing and Mark Taylor, Liberal candidate for the new Seven Hills seat, toured TAD to learn about how our skilled volunteers change the lives of people with a disability. 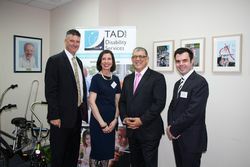 TAD Chief Executive Officer, Danny Kapustin and TAD President, Monica Vardabasso, greeted the Minister and Mr Taylor at TAD’s head office in Northmead. 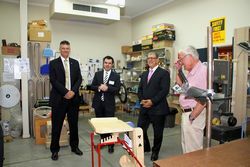 The tour commenced with TAD Board Member and volunteer of 39 years, Bill Phippen OAM and TAD volunteer of 5 years, Alan Stone demonstrating some of the custom equipment designed and built by TAD volunteers. This included a standing frame to help children with disabilities improve their standing and posture and have a chance to use their hands and develop fine motor skills. The frame is built to the specifications of the child, is adjustable as they grow and is affordable thanks to the volunteers donating their time. 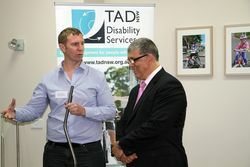 Brendan Worne, TAD Operations Manager, then demonstrated the Freedom Wheels modified bikes which enable children with disabilities, even those who cannot walk independently, to enjoy the exercise and fun of riding a bike when it was never thought possible. 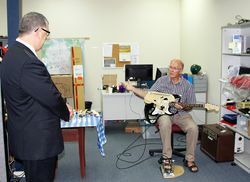 The final stop on the tour was TAD Volunteer, Tom Yelland, demonstrating a one-handed guitar prototype he was working on for a young man who had lost the use of the right hand side of his body after being hit by a train. He had enjoyed playing guitar with his father and wanted to revisit this once-loved hobby. Tom devised an overlay to a guitar with 3D printed components to enable the strumming to be controlled by a foot pedal. “As we do transition into the NDIS, choice, control, people being able to do what they want to do, when they want, that’s all fantastic if they are actually able to acquire the service, acquire the piece of equipment or buy the bike that they can do it with, because there really is no point in having choice and control if we don’t have providers like TAD doing such a great job in providing that service and providing that equipment. And you do great work,” says Minister Ajaka. 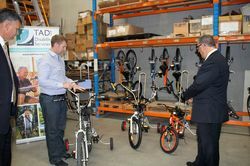 TAD Board Member Matt Kayrooz presented the Minister with a model bike, modified by a TAD volunteer to thank him for visiting and learning about the personalised equipment, technology and services provide by TAD staff and volunteers.